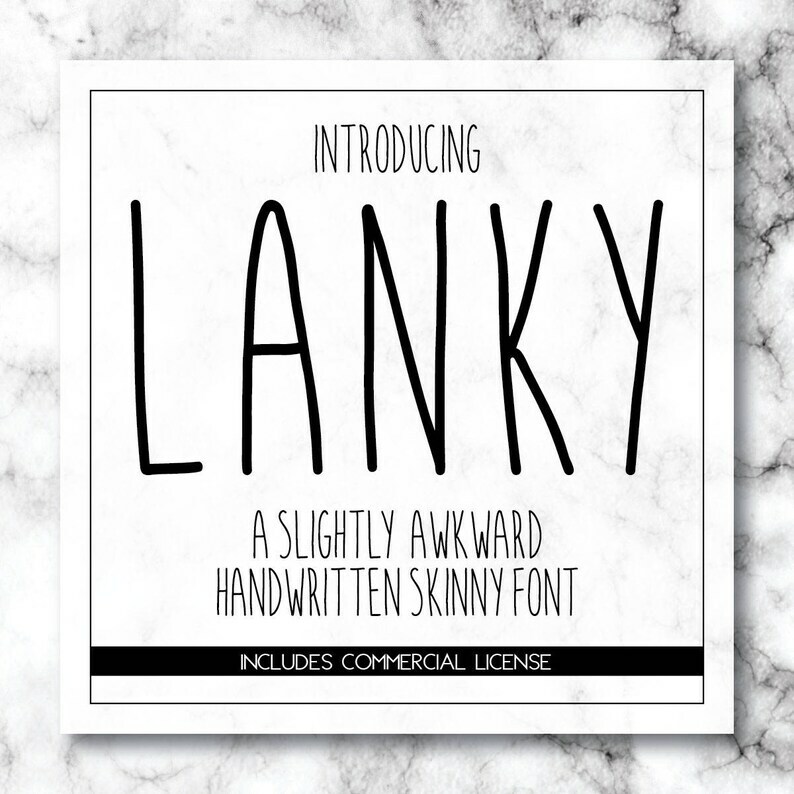 Say hello to Lanky! An all cap handwritten tall skinny installable otf font. This typeface is perfect for adding a touch of whimsy to your projects. Smooth lines, even if a little wonky, make this font great for cutting machines, sign making, and stationery crafts. This listing includes both a personal and commercial use license. My goal is to help support your small business and craft needs. The Copyright for each digital file still belongs to Heidi Thorp/NorthEighty and is non transferable/non exclusive. You (the buyer) cannot sell, copy, give away, claim as your own, or transfer (in part or in whole) the file in any form. Watermarks and logo will not appear in your digital download files. There is no need to give me credit, but it is always appreciated. Please tag me on instagram @northeighty, I would love to see what you are making! Love this font! Perfect for my cutting machine. This is a really great font and the seller was very quick in responding and very nice! North Eighty accepts PayPal, Etsy Gift Cards, Visa, American Express, MasterCard, and Discover credit cards for payment. Payment is due at the time of order, and North Eighty reserves the right to cancel a transaction if payment does not clear. For personalized and custom orders the customer has one week to purchase the listing once it has been created. If payment does not clear within that time frame, we will cancel the order and remove listing. You do not need a PayPal account to use this option, and can sign in as a Guest. To use this option, please follow the prompts and refer to PayPal.com for any additional questions. North Eighty reserves the right to evaluate all refund/exchange requests on a case by case basis. Due to the custom nature of many of my products, refunds/exchanges are not offered for those products unless an error was made by North Eighty in production or an item arrives damaged by the postal service. It is the responsibility of the customer to ensure their order is correct at the time of placement, and by purchasing a product from North Eighty, the customer agrees to the terms and conditions set forth within these policies. Additionally, due to discrepancies in computer monitors your product may not match the exact color on your screen. This does not qualify for a refund or exchange request. 1. Contact me within 2 days of receipt via Etsy message. 2. In this message detail why you are requesting the refund or exchange, and include pictures of any damaged products if applicable. 3. If an exchange or refund is approved, the customer must ship the product back to North Eighty (including a tracking number) at their own expense. 4. Shipping costs are nonrefundable. SVG, Clipart, and Digital Paper downloads includes both a personal and limited commercial use license. My goal is to help support small businesses and crafters needs. Please see license specifics below. All licenses are non-exclusive. Feel free to send me a message if you need further clarification or would like an exclusive license for your business. + Create any number of projects for your own personal use or gifts. + Use in your personal or business branding. + You may use this limited no credit commercial license in your home business, on/in a finished tangible product for sale that you have created yourself or by your staff in your studio. + Use in the creation of digital invitations, cards, stationery, planner stickers, etc. for sale. Final artwork must be flattened, so original design can not be extracted. + Upload designs to 3rd party print on demand sites like Zazzle, Printed Mint, Cafepress, etc. HOWEVER, designs need to be altered from the original file purchased and require time, effort, and skill to produce. Use graphic elements to create your own unique design to fit your brand. + YOU MAY NOT + Upload designs to 3rd party printing sites like Zazzle, Printed Mint, Cafepress, etc. without significantly altering the original file, which should require time, effort, and skill to produce. + YOU MAY NOT + Share (in part or whole), give away, copy, claim as your own, or distribute or resell digital files in any way where my images can be extracted from the files. Final products and files MUST NOT compete with or be sold in a way that directly competes with the original files purchased from me. + YOU MAY NOT + Upload patterns or images to 3rd party fabric printers like Spoonflower, My Fabric Designs, etc., OR custom fabric companies. If you would like to have designs printed on fabric, please contact me for a special license. I have many design available for purchase on fabric at Spoonflower and My Fabric Designs. + YOU MAY NOT + Use these designs to print and sell sheets of vinyl or heat transfer vinyl without contacting me for special licensing. + If you are interested in an extended use commercial license, exclusive artwork license, or custom work; please send me a message. The Copyright for each digital file still belongs to Heidi Thorp/NorthEighty and is non transferable and non exclustive. You (the buyer) cannot sell, copy, give away, claim as your own, or transfer (in part or in whole) the file in any form without express written permission or obtaining an extended commercial license. There is no need to give me credit, but it is always appreciated. Please tag me on instagram @northeighty, I would love to see what you are making! Thank you for taking the time to read through my policies for North Eighty. Should you have a negative experience while shopping with me, I want to personally encourage you to message me prior to leaving any public feedback. I am committed to you, and I am always receptive to customer concerns, questions, and (of course) compliments! I am located in Corpus Christi, Texas. North Eighty observes all national American holidays, and as such will not produce product or conduct any business during those times, as I reserve the right to spend this time with my family. It is the responsibility of the customer to be aware of holiday observances as they may impact production and shipping times. + As needed to provide my services, such as when I use your information to fulfill your order, to settle disputes, or to provide customer support. + When you have provided your affirmative consent, which you may revoke at any time, such as by signing up for my mailing list. + If necessary to comply with a legal obligation or court order or in connection with a legal claim, such as retaining information about your purchases if required by tax law. + Service providers. I engage certain trusted third parties to perform functions and provide services to my shop, such as delivery companies. I will share your personal information with these third parties, but only to the extent necessary to perform these services. + Business transfers. If I sell or merge my business, I may disclose your information as part of that transaction, only to the extent permitted by law. + Compliance with laws. I may collect, use, retain, and share your information if I have a good faith belief that it is reasonably necessary to: (a) respond to legal process or to government requests; (b) enforce my agreements, terms and policies; (c) prevent, investigate, and address fraud and other illegal activity, security, or technical issues; or (d) protect the rights, property, and safety of my customers, or others. + Access. You may have the right to access and receive a copy of the personal information I hold about you by contacting me using the contact information below. + Change, restrict, delete. You may also have rights to change, restrict my use of, or delete your personal information. Absent exceptional circumstances (like where I am required to store data for legal reasons) I will generally delete your personal information upon request. + Object. You can object to (i) my processing of some of your information based on my legitimate interests and (ii) receiving marketing messages from me after providing your express consent to receive them. In such cases, I will delete your personal information unless I have compelling and legitimate grounds to continue using that information or if it is needed for legal reasons. + Complain. If you reside in the EU and wish to raise a concern about my use of your information (and without prejudice to any other rights you may have), you have the right to do so with your local data protection authority. For purposes of EU data protection law, I, Heidi Thorp, am the data controller of your personal information. If you have any questions or concerns, you may contact me at northeighty@yahoo.com.